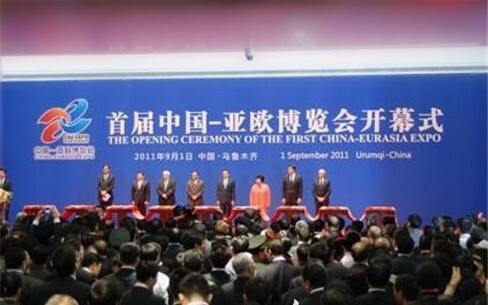 On August 31,2011, Li keqiang ,who is the Standing Committee of the CPC Central Political Bureau and the vice premier of the State Council, respectively met the Pakistan's President, Zardari and the Kazakhstan 's vice premier, Xie Keshe Cardiff, who come to attended the first China Asia-Europe Exposition in Urumqi. During the meeting process, Li keqiang said that the China-Asia-Europe Exposition will construct a excellent exchanges and cooperation platform for China especially the west China and Urumqi communicating with other countries in Asia and Europe . He hoped that every country who presented the expo will make full use of this opportunity to give a further play to the all-sides advantages of China and Pakistan, expand the mutual trade and investment and at last improve the cooperation with each other continuously. In the same day, Li keqiang also met Donald tsang, who is the Chief Executive of Hong Kong Special Administrative Region (HKSAR) and Fernando Chui, who is the Chief Executive of Macao Special Administrative Region. At the same time, Li keqiang expressed the great confidence that Hong Kong and Macao both take the indispensable role in expanding the influence and the broad development space of the Asia-Europe Exposition. It is reported that in the five-day expo, some heavyweight activities like the opening ceremony and China-Asia-Europe economic cooperation development BBS etc will be greatly held here. Meanwhile, this expo will also hold several BBS, thematic projects, trade and investment meetings. At present, it is sure that there will be many countries and regions and the international organization's Presidents, Prime Minister and dignitaries presented at the diverse activities of this expo. What's more, there will also more than 300 persons and groups that include China and foreign provincial officials, industry and commerce groups and associations' leaders, international organizations representatives, the foreign ambassadors and the Chinese envoy, the senior managers of the world top 500 enterprises to take part in the activities. The people who attend the activities will reach to 50 thousands. The organizing committee has received more than 500 submitted foreign cooperation projects, among those projects, there were 179 projects have already through the preliminary examination and determine to sign up, the aggregate amount also reach to 226000 million. Shanghai Shibang Machinery also brings the latest inventions and the star machines come the excellent expo, the all give the expo a grand opening. Welcome the insiders to our site to exchange and communication. The first "China-asia-europe exposition" exhibition information of Shanghai Shibang Machinery CO.,LTD.